1. This is a new strain of swine flu that is not of pandemic nature at this point. 2. There have been no cases of the new swine flu passed from human to human as of August 9, 2012. 3. 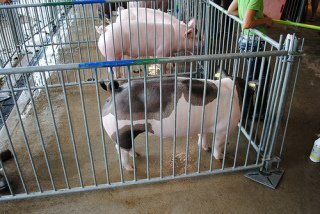 All cases have passed from swine to human, and most human cases have occurred from contact with swine at fairs. As the virus continues to spread, however, human to human contagion will doubtless occur. 4. This strain of swine flu does have a gene in common with the 2009 swine flu that became a pandemic, but so far, cases have been relatively mild. Pigs exhibit signs of flu just like humans, by coughing, sneezing, and runny noses. CDC recommends washing hands, keeping human food and drink away from livestock barns, and keeping children and elderly persons, as well as others with fragile immune systems, away from livestock altogether.